When planning a major home remodeling project, such as a room addition, you need to decide early on if you are going to act as the general contractor project manager, or as an owner contractor manager. If you decide to act as your own home remodeling general contractor project manager, you will ultimately be responsible for hiring subcontractors, inspecting work, calling for municipal inspections, and running the finances, e.g. paying the bills. If you act as an owner contractor manager, you will actually contract with a general contractor to oversee the construction of the home remodeling project. You can decide when hiring the general contractor if you will have minimum oversight, or will want to include your approval in all subcontractor work performed prior to making payments. To act as your own general contractor or want to participate heavily in an owner contractor management relationship you should have some level of knowledge on how to work with contractors and subcontractors. In addition, you should have the abilities to read blue prints and plans. Without this type of experience your home remodeling project is destined to fail. Managing subcontractors is akin to herding cats. Each contractor and subcontractor has an independent streak as they are their own bosses. Consequently, as a homeowner contractor manager, it’s important early on to let them know who is in charge of the project, and who is paying the bills. It is also very important for them to understand that you have some familiarity in the home remodeling or construction process and understand the builder language. If you do not establish these points with your subcontractors you may find yourself getting taken advantage of. Make sure you are meticulous on schedules, budgets and plans. In addition, keep records of each subcontractor quote, material deliveries and payments. By keeping good home remodeling project records you can better control costs and prevent disagreements down the road with sub-contractors. With good project management records, e.g. schedules, you can also know when best to contact sub-contractors to show up on the site for their respective phase of the project. Make payments only after the work has been properly inspected. You, as the homeowner contractor manager, should make sure the completed work complies with the home remodeling plans. 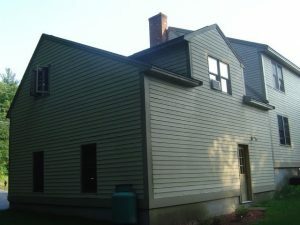 In addition, the local municipal building inspector should also inspect the work for building plan and code compliance. Realize that once you hand over the money to the contractors / subcontractors, it is extremely difficult to get uncompleted work finished. Though you need to make it clear that you are the owner contractor manager and that you are the boss, and have final approval on inspections, it is a good idea to show some level of appreciation time to time. For example, showing up with an afternoon snack or treating the crew to lunch is always a nice gesture. Also, consider including portable toilet facilities and a picnic table on the site to provide some basic level of comfort to the contractors. Another major item that you need to have when managing a home remodeling project is liability insurance. It is important to have liability insurance on the project site for both workers and non-workers. You would be surprised how many neighbors tour your new custom home construction project after hours or on the weekends. If one of them gets hurt, guess who they are going to call. When managing a home remodeling project, the most important thing to remember is that change is constant. Consequently you should prepare for what-if conditions by establishing back up plans and contingencies. For example, if at the last minute an electrician subcontractor decides not to do your home remodeling project, you should have a second electrician ready and willing in the wings. The backup electrician may not be able to jump immediately onto your project, but at least you should be able to mitigate some of the schedule slip. I hate to say it, but cash is still king. Sometimes throwing dollars on the table as a “sign-on bonus” incentive can help. By following these simple guidelines you can go a long way in ensuring the proper construction of your home remodeling project, and completing it on time and budget. 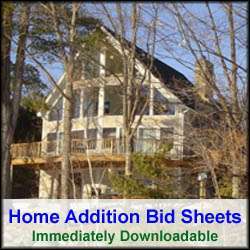 To obtain accurate and consistent home building contractor quotes, see my Home Addition Bid Sheets. They provide a request for quote section that you can provide to prospective home building contractors. It also includes a comprehensive cost breakdown table, in Microsoft Excel format, that allows the home building contractor to include their projected home building costs for every phase of the project.